TSA Knife Rules: Can You Take a Knife on a Plane? What's a great way to spend time in the knife shop with kids? Show them how to make knives from their favorite TV shows and movies. Why Would a Company Make Knives in the USA? With all the pressures to outsource, why would a knife company choose to manufacture in the United States? It turns out there are plenty of benefits to keeping things local. The BLADE Show is the perfect place to spotlight a new release. Here are 13 knives that debuted at the 2018 event. Awards recognizing the highest achievement in the custom and factory knife industries were bestowed the evening of Saturday, June 2, 2017, at the BLADE Show in the Cobb Galleria. 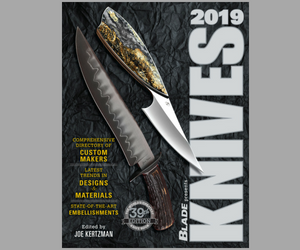 BLADE Show 2018 kicks off June 1 in Atlanta. In the hurry to get everything ready, don't forget these tips so you can attend the world's greatest knife show like a pro.